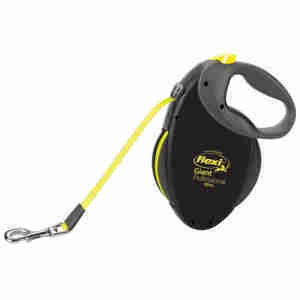 This large Flexi Giant Professional tape leash is designed for walking large breeds like yours in tough conditions. This leash gives you and your dog freedom of movement while always making sure you have complete control. Even if your pet gets excited and likes to pull, you can easily reel them in if needed thanks to the retractable mechanism. It's also easy to maintain your grip, thanks to the specially designed ergonomic handle. Large dogs can pull hard and even the toughest leash is no good if the body isn't up to the task. The solid and robust construction of the Flexi Giant tape leash means it can take a lot of punishment and you can rely on it even after extensive and demanding walks. This makes it ideal for professional as well as recreational use. Walkies are essential for any dog, especially larger breeds who need to be active to stay in shape. When you're out in the park or fields, especially later in the evening, it can be hard to see where your pet is even if they’re on the lead. This is even more true for retractable leads, as you might not be able to tell how far away they are from you. The neon tape on this leash means you'll always have a good sense of where they are.